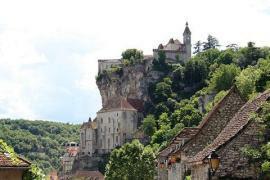 Loubressac is a wonderful village in the Lot department overlooking the Dordogne valley. 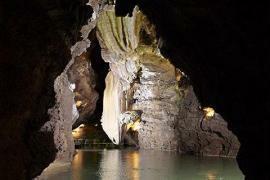 It is close to the attractive town of St Ceré. 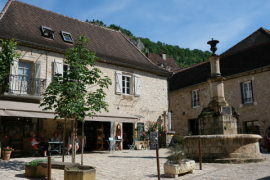 As you wind up the hill to the hilltop village of Loubressac you are greeted by the sight of the lovely stone houses with small flowery gardens, brown terracotta roofs and painted shutters - often in shades of burgundy - delightful! The houses are built in a lovely pale gold, almost white stone. The streets wind upwards to the shady square with its church dating from the 12th to 16th centuries. 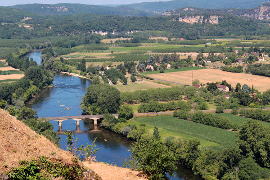 As you wander round the village you catch glimpses of the surrounding countryside - the valleys of the rivers Dordogne, Cère and Bave, it offers one of the best views of the Dordogne region including views of the Chateaux Castelnau which is near to Bretenoux and which is one of the great castles of France. 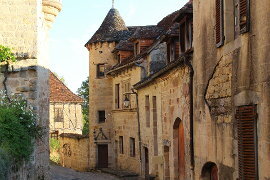 Loubressac does have a chateau but it is almost impossible to see anything of it other than its imposing gateway. 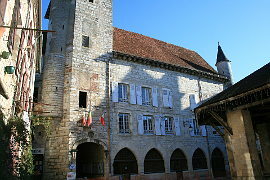 The chateau dates from the 15-17th centuries and its maison des gardes to the 15th century. 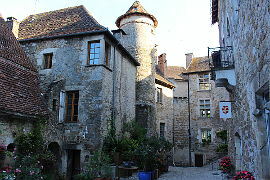 Loubressac is one of the 'most beautiful villages of France'. 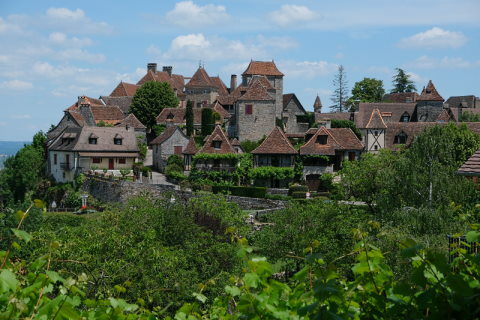 It is also rightly proud of its floral endeavors and has won the prizes of 'most beautiful flowering village of the Lot' and 'best flowering village of the Midi-Pyrenees'. There are lots of walks in the beautiful countryside near Loubressac and these take you to tiny villages and hamlets in the vicinity. The Dolmen d'Aurast close to the village is a Neolithic dolmen which is still in very good condition. 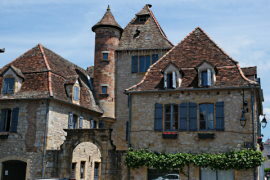 Loubressac is one of the most beautiful villages of France and amongst its neighbours are several other 'most beautiful villages'; Autoire and Carennac are both nearby.